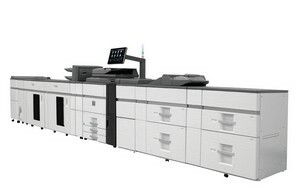 Sharp is launching two new models which they say are perfectly adapted to business environments such as printshops and integrated reprographics departments where color Print On Demand (POD) is a requirement. These machines have only been launched in the USA so far, not in Europe nor even in Japan as yet. The MX-6500N and MX-7500N run at 65 and 75 ppm respectively, and have a variety of finishing options available, including a Plockmatic booklet finisher which can handle up to 120 pages (30 sheets). The optional EFI print controller, based on the latest Fiery FS100 Pro, can be driven directly from the equipment's interface, which is a 15.4-inch touch-screen. Finally there is also a keyboard with a touchpad. Sharp is also launching the ability to print from edge to edge of a sheet, so these printers are able to produce full-bleed documents without trimming. If this feature proves able to print in quality right to the edge of the sheet, it will be a considerable advantage which should help these machines to find a place in a marketplace in which Sharp remains a newcomer. These machines are on show at Print 13 in Chicago, which closes on September 12.